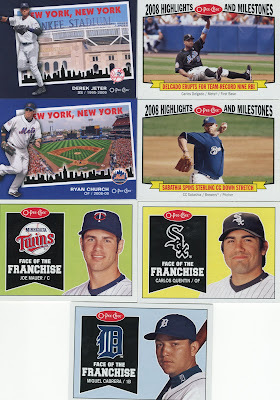 As most of you know I have been writing articles for Upper Deck's blog over the last couple of weeks. In exchange for writing they are offering cards, which is what they money would be spent on anyway so it's a win win for me cutting out the middle man. In light of only needing 36 cards to finish my 2009 O-Pee-Chee base set, I requested a box of them thinking it would get me to completion or very close to it at least. I'll start by making it clear that I did not get a "loaded" box by any means, so don't get too excited. Out of however many base cards are in a box, I needed SEVEN of them. Which left me with roughly 200 doubles and 100 triples, frickin sweet. I logged my SEVEN cards in, and went through Sooz's want list and she needed 36, and Flash over at Dropped Third Strike needed 63 of them. They each got more out of this than I did, even with the inserts. I got 4 inserts I really liked and the rest were blah. I have yet to go through the black borders to see how many I needed, but rest assured I will let you all know if that turns out to be disastrous as well. I have SO many doubles so if you are trying to put this set together and can help me get those last 29 cards I would be more than happy to send you plenty in return. I probably even have a couple of black border doubles floating around as I try to complete that next. 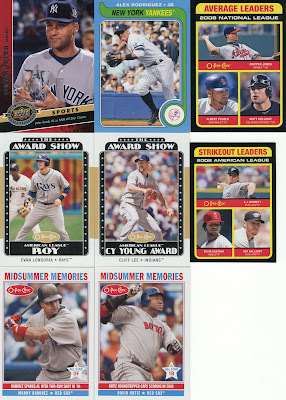 I have have following (minus a few Ranger cards I shipped out Friday. Let me know if you need any of them. After you let me know if you want any I will offer them up to Flash. Hey thanks, I only need 460 off your list. Do you need any to complete your set?